5 Foods. 8 Awards. 1 Mission. Our foods are made with high quality ingredients, with no artificial anything. We donate 100% of net profits to hunger-relief charities. Our customers, the press and national chili competitions say we're pretty darn good. Come Give us a try at Lucky's in Cleveland this Saturday, April 13. Now serving Craft Sauces by Double COmfort at all BrewDog USA Locations! ​CRAFT SAUCES AND CRAFT BEER FOR ALL! Try Juke Joint Green Pepper Sauce all day at Tommy's Diner in Franklinton! FOR ALL YOU Chile Heads and Comfort Food Connoisseurs! Enjoy a taste of the south with Double Comfort hot sauces and spice blend. Try our crazy hot MEMPHIS HEAT, or enjoy the very approachable JUKE JOINT Green Pepper Sauce. Need to up the kick in everyday foods? Just add a little SOUL OF THE SOUTH Spice Blend. Double Comfort opened its doors in 2014, to raise money for local food pantries through the sale of delicious, high quality southern foods based on the flavors of Memphis. That tradition continues today, with all profits from the sale of Double Comfort Hot Sauces anD spice blenDS going to hunger-relief charities. Through our products, over 110,000 meals have been donated to hunger-relief charities. Soul of the South, 2nd Place. Memphis HEat red hot habanero sauce, winner 2nd place in the HOT hot sauce category. 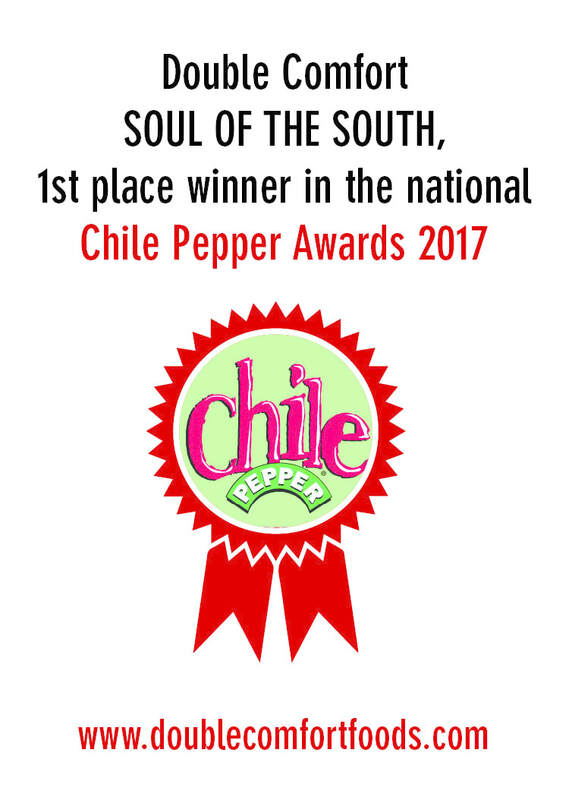 Soul of the South, winner in the table seasoning category.